Easy to find, this house is ideal for all ages, and very well equipped. Welcome to the domaine Thomson which is located in the beautiful, quiet and tranquil village of Engravies, foothills to the Pyrenees. 15 minute drive from all amenities. Wooden beams throughout, large open fireplace, and comfortable furnishings. This is a charming old farmhouse which sleeps 12, with very comfortable rooms, two double rooms with a double and single bed in with ensuite shower and toilet, one family room with one double and two single beds, and one double bedroom. Plenty of space indoors and out, to sit and relax, swim, or chill out. Opportunities for all sorts in the surroundings, the Cathar country and the caves of the Pyrénées, activities in the area, which is noted for its wildlife, wild flowers, orchids and natural beauty, from walking, cycling, horseriding, skiing, visiting the Cathar Castles, browsing in colourful bustling markets held in local towns, sampling locally produced wines and foods. There are three bathrooms in the house; two that are private shower rooms attached to two of the bedrooms, these contain a shower, toilet and wash-hand basin; and the other, a large spacious very light-filled `holly-wood`style bathroom which has a large shower, bath and two wash-hand basins and large mirrors. All the bathrooms are supplied with hairdryers, bathmats and toilet paper, and there are electric sockets for the use of electric shavers, or hair dryers. The house and its furnishings are comfortable. - The utility room has a chest freezer and an extra fridge. It also contains the dishwasher and clothes washing machine. And masses of extra cooking utensils surplus to what is in the kitchen. - The kitchen is well equipped in the normal way with sink, oven and hob, micro oven, toaster, electric kettle, kitchen utensils, etc. There is also a family sized table and six chairs. - The dining room has a banquet table with seating for 12. - The sitting room has comfortable sofas and armchairs, and a small billiard table. - In the garden there is a large terrace, with opportunities to move outdoor tables and chairs into other positions under trees in the lawned area if preferred. 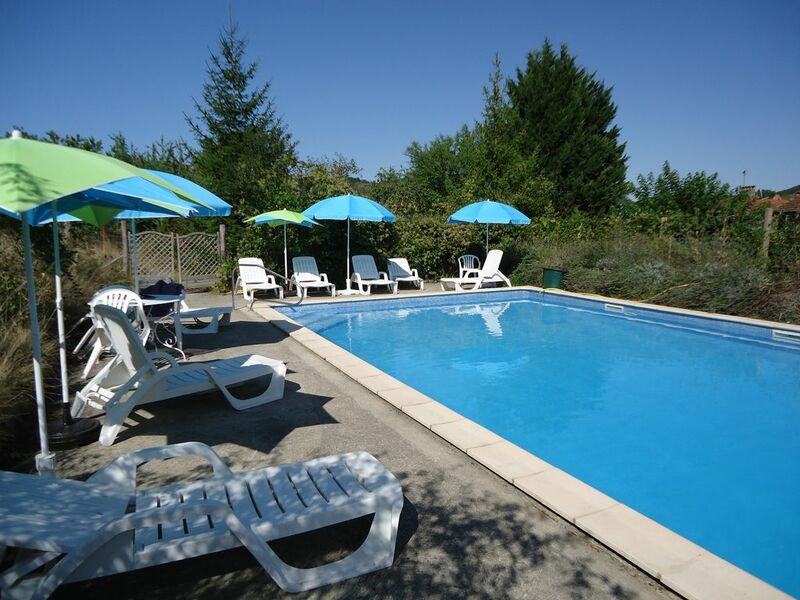 There is an outdoor barbeque area, a large beautiful swimming pool (12m x 6m) with a generous sunbathing area. The pool is securely fenced on all sides with a lockable entrance gate to it. There is table tennis and plenty of space to play. Engravies is located to the south of Toulouse (1hr) and south-west of Carcassonne (45 mins), about half-way between Toulouse and Andorra, easy to find nestling in the foothills of the Pyrenees. 15 mins from Mirepoix - ville Cathar. 30 mins from Foix - principal town of the Ariege. 30 mins to 1hr to the very high mountains, depending which you choose to visit. 50 mins from Ax-les-therms - ski resort in winter and fantastic hillwalking and rockclimbing in summer. 40 mins from Tarascon - rockclimbing, and the start of the Ariegeoise Sportif cycle race on the 26 June 2010. Ski: There are several ski stations within one hour`s drive - Ax les Thermes, Mont d`Olmes, Plateau de Beille. All only about 50 minutes away. You will require chains on your tyres in winter. Andorra has many ski resorts, the nearest being 90 minutes away.